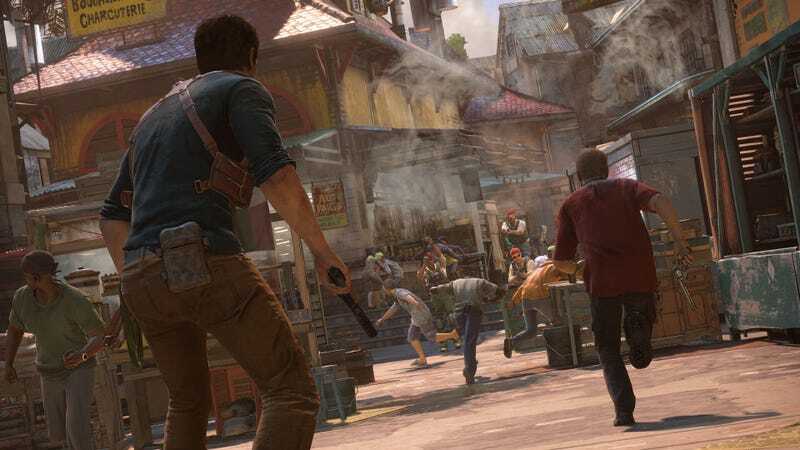 Uncharted 4 won’t be out for another two weeks, but retailers across the world have somehow lost track of that, leading to widespread chaos and pandemonium. Also spoilers. Earlier today, the UK-based gaming website Video Gamer spoke to someone who’d walked into a CeX electronics store and bought the game on Monday. He just walked in and bought it. Meanwhile, this morning Amazon started sending out notifications to customers who had pre-ordered Uncharted 4, announcing that the game would ship today. “Arriving today by 8pm,” they said. Whoops. So Amazon doesn’t seem to be sending the game out early, but at least a few people, mostly in Europe, have gotten Uncharted 4 before street date. It’s safe to say that if you don’t want to be spoiled, you should be careful. There’s an easy explanation for most of this: Uncharted 4 was originally slated to come out today. Last month, Naughty Dog announced another two-week delay, bumping it to May 10 (my birthday!). It’s likely the last-minute release date shift messed with some of these companies. Local retailers in your area might even be selling the game right now.